My animals are check by vet regular. Maybe more often due to rescue. They are very health. Some are the comments they have dead cats and worms from it are completely wrong . if you have wild animals eating out of the same bowl there are your worms. I have been using the food for a long time over more than 5 to 6 years. Never a problem. Excellent value as will. I use outdoor recipe. I think there's worms in the food? 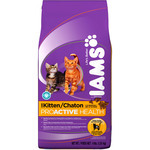 I was treating my cats for worms with a worm drop medicine and picked up some Special Kitty soft food. At first I got the poultry variety pack but my one cat didn't like one of the flavours. I then bought the seafood variety pack. I opened and fed them the salmon dinner flavour. They barely ate it and what was left over dried up. I saw these white things dried in with the food. The food was a dark brown so it stood out. I didn't think much of it till I opened the next can. It was the seafood surpreme so it's a totally different flavour yet it was still full of these things that look like worms. They are white and look like rice. After the one can dried out they curled up. My cats aren't really eating much, are constipated and throwing up all over the house. So much for the "100% complete and balanced nutrition for kittens and adults cats" that's promised and written right on the box! special kitty cat food NO!!!! 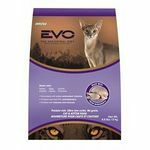 I always used 9lives cat food but decided last week to try special kitty for my 3 cats well I've noticed they barely touched the food and were getting thin. I went to inspect the food further this morning and noticed the food in my sealed container was clumped near the middle of the bin and was white in the middle. I was disgusted I'm guessing it was mold I've only had the food for a week in the container I always keep there cat food in n never had this problem before. I'm now taking my cats to the vet to be checked out and have saved samples from this food. So it can be tested. I will never buy this food again n pray my cats are not sick!!!! Have a farm and farm cats.. got the outdoor special kitty.. the turkeys, ratcoons, posums, squirals etc all eat with the cats..well NONE of the animals will eat it!!!!! Thats bad... most of them will eat anything and be happy. I dumped it out in the woods and nothing ate it!! When it rained it washed into the ground! Save your money,don't know how they can put it on the market. We have outdoor cats that we feed. We've been feeding them for years. Of course they have babies and they grow in numbers and some go. Right now there's 8 out there. We buy large bags of food and feed them twice a day. Since we've been feeding them this 44 lb bag of garbage, 5 have left and three just meow for food. These cats would rather starve than eat this. How BAD does a product have to be that a animal that will eat anything won't eat this? 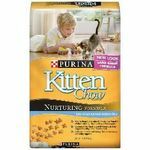 There are a lot of kitten foods out there. Some have higher quality ingredients than others. However, higher quality usually means much more expensive. This kitten food has gotten really mixed reviews. I think it is ok. 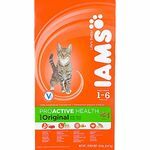 I don't think it is the worst food for my cat and I don't think it's the best. My cat seems to eat it and enjoy but she is not a picky eater. 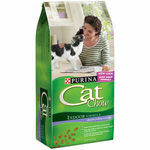 I am on a very tight budget and this is fairly inexpensive compared to many cat and kitten foods out there. The ingredients do compare to many other cat foods that are name brand. Yes there are fillers and things that may not be the best but are not terrible. I don't buy this all the time. I do look for coupons and will rotate between brands since my cat seems to like most anything I buy. Quality of Ingredients These aren't the highest quality ingredients but they are ok and will give your cat needed nutrition. Flavor Selection There are different flavors and varieties of this cat food. My cat enjoys them all. This is the cat food I buy when it'as an emergency situation. I forgot to get their regular brand and it's a holiday or the store I'm at is out of their regular brand. I generally buy a small container of this till I can get what I normally buy for them. They do like it fine and it's a much less expensive option. They do prefer their regular dry food to this but it's fine every now and then. Quality of Ingredients It looks to have basically the same ingrdients as most of the leading dry cat foods but it's kind of an off name so I really don't feed them this on a regular basis but I have friends that do and their cats seem very healthy. It's certanly a good option if you have multiple cats or or on a tight budget or are buying food for a stray and want to feed them till they find a home or get adopted. Flavor Selection I really don't see much in the way of flavor selection. It's generally on the shelf by itself and I never noticed different flavors other than the original. Do not buy this cat food. My cat will basically eat ANY food. Special Kitty Cat Food is one she will NOT eat though. She refuses to eat it and just walks away from her dish. I only bought it for her once. I didn't think much of it until I read the ingredient list and then looked at some reviews online. 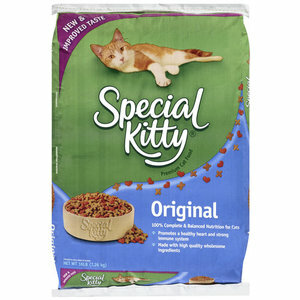 Special Kitty Cat Food is extremely cheap. It's cheap for a reason. The ingredients are awful quality. If you have a bag of this around, go look at the ingredients. There is basically no nutritional value to this food. Also look at the color of the food compared to other brands. The dye they use has got to be horrible. My cat turned down this food. She doesn't turn down any food. Eating is her favorite hobby. At first I thought she wasn't feeling well but that wasn't the case. I went and got a different food and she ate it right away. I do NOT recommend this horrible quality food. There is no nutritional value and the ingredients are horrible. Even my "eat anything in the world" cat refused to eat it. You know there is something weird with the food if that occurs. My cats have always had Special Kitty and all lived long, healthy lives. Yes, I'm a cheap person, but I wouldn't feed my cats anything they won't eat. I have even tried more expensive brands, and my pickier cats didn't like those brands. I hear things about the quality of this food, and the lack of nutrition, but to be honest, I don't believe any of that. What matters is my cat is eating what she likes and she stays healthy. I've never had a cat with a serious ailment or malnutrition from eating this food, so I believe it's fine for her to eat this. Quality of Ingredients Quality of ingredients doesn't matter very much to me. If she is eating what she likes, then I am happy. Flavor Selection If she eats it, then that is what I go by. I never understood the flavor aspect of cat food and people hounding on brands for flavor selection. If she's going to eat it, then why does it matter what the flavor actually is? This "original" flavor is perfect for my cat and she's never had problems eating it.